Keijzer, N., Lein, B., Negre, M., Tissi, N. 2013. 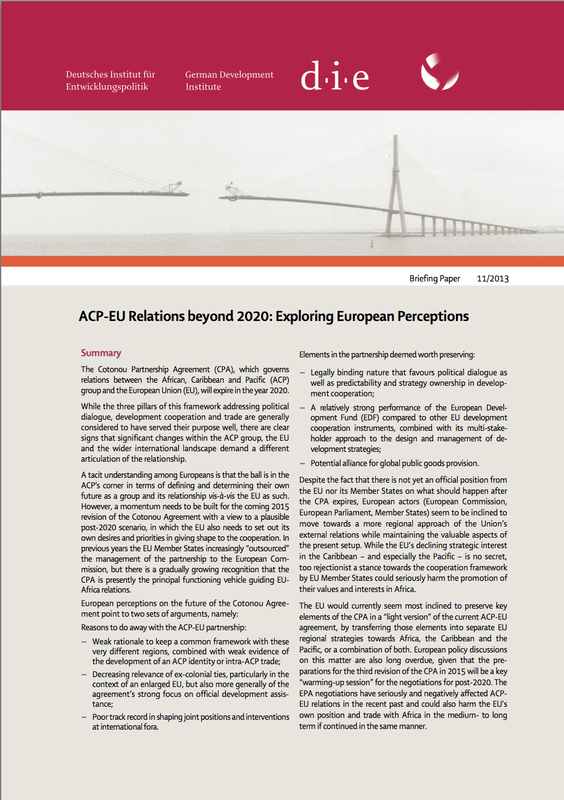 ACP-EU relations beyond 2020: Exploring European perceptions. (DIE/GDI Briefing Paper 11/2013). Bonn: German Development Institute. The Cotonou Partnership Agreement (CPA), which governs relations between the African, Caribbean and Pacific (ACP) group and the European Union (EU), will expire in the year 2020. While the three pillars of this framework addressing political dialogue, development cooperation and trade are generally considered to have served their purpose well, there are clear signs that significant changes within the ACP group, the EU and the wider international landscape demand a different articulation of the relationship. A tacit understanding among Europeans is that the ball is in the ACP’s corner in terms of defining and determining their own future as a group and its relationship vis-à-vis the EU as such. However, a momentum needs to be built for the coming 2015 revision of the Cotonou Agreement with a view to a plausible post-2020 scenario, in which the EU also needs to set out its own desires and priorities in giving shape to the cooperation. In previous years the EU Member States increasingly “outsourced” the management of the partnership to the European Commission, but there is a gradually growing recognition that the CPA is presently the principal functioning vehicle guiding EU- Africa relations. − Poor track record in shaping joint positions and interventions at international fora. − Potential alliance for global public goods provision. Despite the fact that there is not yet an official position from the EU nor its Member States on what should happen after the CPA expires, European actors (European Commission, European Parliament, Member States) seem to be inclined to move towards a more regional approach of the Union’s external relations while maintaining the valuable aspects of the present setup. While the EU’s declining strategic interest in the Caribbean – and especially the Pacific – is no secret, too rejectionist a stance towards the cooperation framework by EU Member States could seriously harm the promotion of their values and interests in Africa.